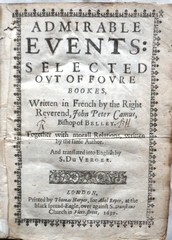 Admirable events: selected out of foure bookes, written in French by the right reverend, John Peter Camus, Bishop of Belley. 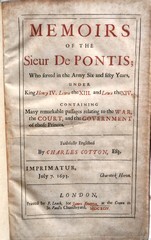 Memoirs of the Sieur De Pontis; who served in the army six and fifty years, under King Henry IV. Lewis the XIII. and Lewis the XIV. 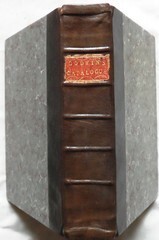 Containing many remarkable passages relating to the war, the court, and the government of those princes. 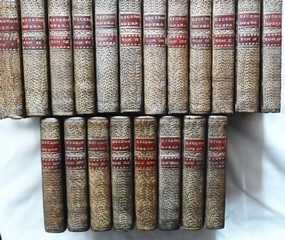 A Catalogue of the Bishops of England, since the first planting of Christian religion in this island, together with a briefe history of their lives and memorable actions, so neere as can be gathered out of antiquity. 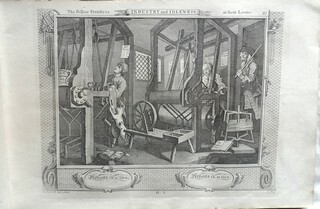 Bound volume of 88 plates by Riepenhausen after William Hogarth.